When a fire devastates your home or business, it's important to have fire damage restoration experts on site immediately after the disaster. After your home is damaged by fire some of the after-effects can include smoke damage and water damage from putting out the fire, even possessions that were not directly touched by the fire can have damage from the smoke and soot. The residue left after a fire can be toxic to your health, so it's important to have professional fire damage restoration. 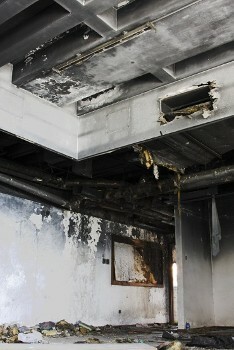 Contact MI Disaster Team for our trusted and professional fire damage restoration services. Our trained professionals will assess the damage and have the knowledge and experience to restore the property and contents to their pre-loss condition in the shortest time possible. It is important that you get immediate fire damage restoration services, which is why we offer 24-hour emergency service. Providing fire damage cleanup for residential and commercial clients in Southeast Michigan including Ann Arbor, Bloomfield Hills, Clinton Township, Commerce, Commerce Township, Dearborn, Dearborn Heights, and surrounding areas.